For piano and cello, about Grade 2 level, for young players. 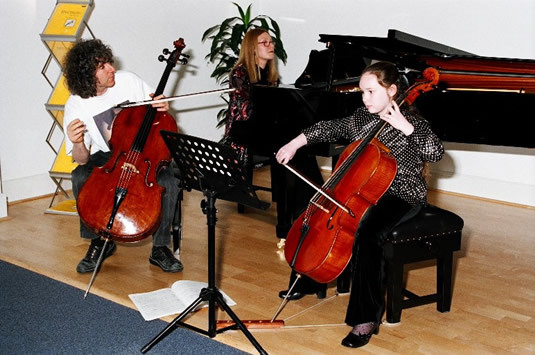 This short work was written at the request of the cellist William Bruce, the commissioning editor for the Associated Board’s innovative Spectrum for Cello – a book and CD containing 16 specially composed pieces for young players. As one of the 16 featured composers I was asked to write a concert piece lasting approximately 90 seconds, true to my own sound world, yet offering technically approachable material for cello students, amateur and professional players to enjoy. Steven Isserlis leads a masterclass on Param Vir’s ‘angel blue’. Thalia Myers at the piano.